Semmelweis University is celebrating the 200th birthday of its denominator, Semmelweis Ignác in 2018 and the 250th anniversary of its foundation in 2019. These assign the mutual mission of Semmelweis University and its rector: tradition, knowledge, humbleness and development based on them. By the resuscitation of tradition, I swore my rector’s oath on 28 June 2018 in front of the Senate of Semmelweis University. I swore that I would enhance the reputation of Semmelweis University, promote its development, retain its values and traditions, help the prosperity of the University’s students and colleagues. To foster the development of the University’s performance in education, research and innovation, to develop the quality of patient care, to strengthen the foreign students’ commitment to our profession and our nation. Semmelweis University is the flagship of medical and health sciences education, research and healing care in Hungary and in the region. Based on the Times Higher Education rankings, Semmelweis University, the only one in Hungary, is among the best 500 universities. 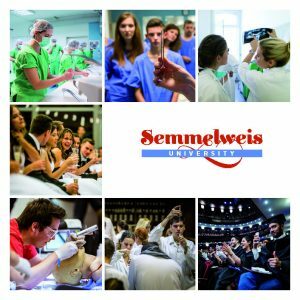 Semmelweis University is in the first 2.5% among the 28,000 universities of the world. In the Quacquarelli Symonds specialty rankings, it is also at the 151st-200th places in medical and pharmaceutical training. 36% of the Hungarian medical students, 35% of the Hungarian students of health sciences, 34% of the foreign students, altogether 11,000 students study at Semmelweis University. The 3,800 foreign students come from 60 countries in 5 continents and become ambassadors of our country. Nearly 1,700 tutors, researchers and teachers, 300 research groups, more than 4,500 physicians and health professionals help our education, patient care and research activity. In the field of publication in the most prestigious magazines, our University is the second after the Hungarian Academy of Sciences. As one of the biggest patient care institutions in Hungary, our departments receive 200,000 outpatients and 10,500 inpatients monthly in 4 blocks and in nearly 40 professional units. Our primary goal in the future, trustworthily to Semmelweis’ spirit, is to put our University among the best 100 universities of the world. The basis for this is the theoretical education level and the outstanding scientific performance of the Faculty of Medicine. The world-wide acknowledged practical education of the Faculty of Dentistry. The prominent specific scientific result of the Faculty of Pharmacy. The Faculty of Health Sciences, our second biggest faculty, which ensures the health sciences education in the broadest spectrum in Central Europe. The gradually expanding education of the Faculty of Health and Public Services is due to its wide and exemplary fundraising ability. 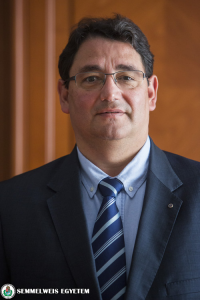 In our university’s latest and internationally renowned faculty, András Pető Faculty, takes place the world-wide recognized Pető-method of conductive education, which was given the “First Intellectual Hungaricum” award. One of my most important goals is the closing up of the practical education to the level of the theoretical education and to have them built on each other. The basis of good medical and health sciences education is the patient-centred approach. My strategical goal is to make Semmelweis University a defining educational, research development-innovation and clinical centre on gradual and on post-gradual levels. In order to gain this, we have to create inner research networks that overarch the faculties and integrate their strengths. It is indispensably important to correct the conditionalities and qualities of education and research, whose key elements are fundraising, development of international scientific relations and expansion of our public activities. I believe with deep commitment in the triple unit of theoretical education, basic and translational research and medicine, which are the bases of Semmelweis 21st Development Programme, because it is not only the most important condition of quality training and high-level healing but also the most solid keystone of the expansion of our performance. We can raise Semmelweis University to a higher level among the leading universities in the world if we strengthen the bases that are necessary to the patient- and practice-oriented training and to the translational research-innovation. The quality development of clinical capacity is the key to practical medical and health science training. Besides the infrastructural development, the real key of innovations is the world-class human resources. Keeping, strengthening and expanding it, as well as further strengthening the ongoing shaping of the community and Semmelweis citizens must be our task in education, research and patient care. It is a highlighted task to pay primary attention to the formation of work environment that has a significant role in the quality of life of the workers. It is a strategical goal to make Semmelweis University a family-friendly university and a family-friendly workplace. As a medical and health sciences university, our colleagues and students must be able to set an example in the fields of health education, prevention and health preservation. In order to achieve this, besides the development of education-research-patient care infrastructure, the development of the quality of the student environment in its wider sense, and the development of recreational and sporting environment are necessary. “Semmelweis University”, of which we are parts and creators, is a historical trademark and brand, which obliges us to the highest level of educational and scientific performance, and healing service. With this selfless service, we can reach our goals together! My door is open for you!